They went and threw up a bunch of banners declaring their biggest ever anniversary sale, so the pic was too good to pass up. I'm just going to assume that all their previous anniversary sales had ever larger mark-ups than this one. Food Basics is Run By Scammers! I don't pay all that much attention to food prices. For the most part, when I'm shopping for groceries I'll just throw stuff in my cart and pay for it. I might grab a few things I wouldn't have otherwise bought when they're on sale, but for the staples like milk and bread and eggs, I just get them. Even though I don't pay much attention, when you buy things enough you tend to get an idea of what they normally cost, so as a consumer, I found it completely insulting when Food Basics decided to jack up some of their prices and then pretend that they'd lowered them. Prices on things will go up. It's inevitable, and expected over time, so I don't fault them for that. What I find downright fraudulent though, is how they've done it. I know that a dozen large eggs costs $1.97 and that 4L of milk costs $3.97. 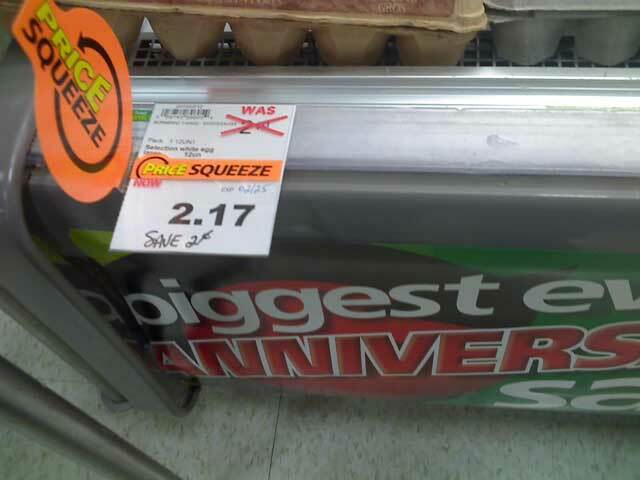 Imagine my surprise then when Food Basics raised their prices and then put big tags beside them saying "PRICE SQEEZE". I guess there's no real definition for what a "price squeeze" is but just intuitively, I'd have thought it was a lowering of the price. I'll define it officially here, now. It turns out that what they really mean is "wallet squeeze". For both the milk and the eggs, the price squeeze tag declared that they're reduced the price by, and I kid you not, TWO CENTS!!!! If it's still there when next I go, I'll take a picture. There, in big letters below the milk, it says "WAS $4.19. NOW $4.17. YOU SAVE 2 CENTS". Same thing below the eggs. "WAS $2.19. NOW $2.17. YOU SAVE 2 CENTS". Now, unless they put the price up an additional 2 cents for an hour or so before putting those tags on, then that's downright lying. I know what the stuff was. I buy it every freakin' week! So there you have it. Food Basics is run by scammers who think their customers are idiots. From now on, whenever you see those "Price Squeeze" tags, you can go ahead and assume they've just raised the price and that you can probably get that thing cheaper elsewhere. NASCAR Brings Back Bump Drafting! Bump-drafting rules will be eliminated at Daytona and Talladega Superspeedway. Teams also will use a bigger restrictor plate at Daytona. Eliminating bump-drafting rules puts responsibility for on-track moves squarely back in drivers' hands. Larger restrictor plates give drivers more horsepower. I can't wait for the Daytona 500! Over the past couple years, NASCAR has been warning drivers about bump drafting, going so far as to prohibit it anywhere but down the straightaways. It might sound like a safe thing to do, but it completely kills the racing at the superspeedways. I applaud this move. Let the drivers figure it out. They've got to know whether they're good enough to do it, and where. If not, they'll wreck. Unfortunately, they'll also wreck others, but none of them want that. They want to win, and now those with the skill to pull it off, will have the better chances of winning.